7 Days to Die is a survival horror video game set in an open world developed by The Fun Pimps. It was released through Early Access on Steam for Microsoft Windows and Mac OS X on December 13, 2013, and for Linux on November 22, 2014. Versions for the PlayStation 4 and Xbox One were released in 2016 through Telltale Publishing. The game's events happen after a nuclear Third World War that destroyed an extremely large part of the world, except for some areas such as the fictional county of Navezgane, Arizona. The player is a survivor of the war who must survive by finding shelter, food and water, as well as scavenging supplies to fend off the numerous zombies (hinted to be the consequence of nuclear fallout) that populate Navezgane. Though there is no real objective except surviving at this moment, the developers hinted at a possible storyline that will be added in future updates. In 7 Days to Die, the player spawns into a randomly-generated world or the preset world of Navezgane, Arizona, with the objective of surviving for as long as possible against the elements and the zombie hordes. As a survival game, the player character is in constant need of water and food for sustenance, as well as being vulnerable to injury and illness. The game is voxel-based (similar in some respects to Minecraft), allowing for simple building, and destruction of objects in a physics-simulated environment (for example, building a structure with no support such as pillars and walls can lead to its collapse). Objects in the world degrade through use, so the player has to search for or make new tools as the game progresses. The player can also gather and create materials—from nature and the remnants of human civilization—to construct these necessary items. While the game includes wildlife that can be hunted for food or will hunt the player, the main hazard is zombies, which are affected by the game's day/night cycle—during the day they are relatively slow-moving and easy targets that can only detect the player at relatively close ranges, but at night they become feral, which makes them move much faster and thus greatly increases their threat. As the in-game days progress, tougher and more aggressive variants begin to appear. Stealth and distraction can be used to avoid unnecessary conflict, while carrying foods that have a smell (such as raw meat) will attract zombies. They are also drawn to areas of human (i.e. player) activity, and will relentlessly attack anything that impedes their movement until they are killed or the obstacle is destroyed—this includes player fortifications. Should they detect the player, zombies will apply the same single-minded pursuit until the player is either dead, or leaves the immediate area. The game's title is a reference to an important event that occurs every seventh day of in-game time, whereby hordes of zombies attack the player's current location en masse—unless sufficient preparation has been made and defences constructed, the player will quickly be overwhelmed. Multiplayer is available through player-hosted servers and enables multiple players to interact and communicate with each other on a single world. Interactions can be cooperative or hostile depending on the used server options. Players can run their own servers or use a hosting provider. Single player worlds have local area network support, allowing players to join worlds on locally interconnected computers without a server setup. Players are also able to provide Wide Area Network support via single player worlds. 7 Days to Die servers can run on consoles, Windows and Linux. There are two supported game modes for multiplayer: Survival (both randomly generated and standard) and Creative. The Windows alpha version of the game was released on August 16, 2013, for people who pre-ordered the game on either Kickstarter or PayPal. As of August 11, 2013, development of the game is ongoing with a Kickstarter campaign ending on August 15. The estimated release date was May 2014 for Microsoft Windows; Macintosh and Linux versions were planned for later in the year. The game was also greenlit on Steam after 23 days getting over 75,000 yes votes, 8,340 followers, and 8,700 favorites. It was number one on Steam Greenlight, after only 16 days with over 56,000 votes. The Mac version was released on September 13, 2013 at the same time as update Alpha 1.1. 7 Days To Die was released to the public on Alpha 1.0. Only users who had backed the game via the Kickstarter Campaign or who bought it via PayPal had access to the Alpha until Alpha 5.0 which was released on Steam as an Early Access game on December 13, 2013. Alpha 7.8 was released on April 4, 2014 and was promptly followed by Alpha 7.9 on April 8, 2014. Alpha 7.10 was later added on April 19, 2014. Alpha 8 was released on May 7, 2014 which updated the visuals to zombie animations and smoothed the terrain for a final time. Alpha Version 9 was released on August 19, 2014 and added random generated worlds, new injuries, new light effects, and new graphics. Alpha Version 10 was released on November 22, 2014 and added a new character creation system with face/body morphing and visible clothing, a new zombie horde world heat map system and a new wellness system. Alpha Version 11 was released on April 2, 2015, where the developers updated to Unity 5, which includes many graphical improvements, a new quality range system for guns, weapons, tools and armor and a new Zombie called "Feral". Alpha 12 was released on July 3, 2015, and added a new vehicle system with a Mini Bike, first weather system, new sound and physic systems, among other fixes and additions. Alpha 13 was released on December 10, 2015, adding temperature survival elements, a skill system, and a redesigned crafting system. The difficulty of the game has increased, but it continues to be popular. Alpha 14 was released on March 26, 2016, with further improvements and more features, a lot of bug fixes, as well as some performance and graphic optimizations. Alpha 15 was then released on October 5, 2016 with major improvements to random generated maps, a trader system, a new difficulty scaling and several more features. The UMA-Zombies that were introduced in this Alpha would be removed in Alpha 16. On June 6, 2017, Alpha 16 was released. This release added electricity to the game for the first time and introduced various traps including electric fences and spinning blades. On November 19th, 2018, Alpha 17 was formally released which added a quest system as well as new vehicles and numerous system overhauls. In April 2016, the game was announced for PlayStation 4 and Xbox One. It was published by Telltale Publishing and released in June and July 2016. The PlayStation 4 and Xbox One versions of 7 Days to Die received "unfavorable" reviews according to the review aggregation website Metacritic. As of June 2018 the game scored a "very positive" review by over 46,000 reviews on Steam and was one of the "Top 100 Selling games of 2017" on Steam, despite still being in alpha stage development. ^ Vandell, Perry (May 29, 2013). "7 Days to Die adds crafting and voxels to your post-apocalyptic sandbox". PC Gamer. Future plc. Retrieved April 11, 2016. ^ Matulef, Jeffery (August 16, 2016). "7 Days to Die combines a voxel-based sandbox with zombies". Eurogamer. Gamer Network. Retrieved April 11, 2016. ^ Barnett, Ben (April 2, 2014). "Impressions: 7 Days To Die". Rock, Paper, Shotgun. Gamer Network. Retrieved April 11, 2016. ^ Coldwell, Brendon (November 27, 2014). "Diary: Seven Days Of Dying In 7 Days To Die". Rock, Paper, Shotgun. Gamer Network. Retrieved April 11, 2016. ^ Whitehead, Dan (January 28, 2016). "7 Days to Die alpha review". Eurogamer. Gamer Network. Retrieved April 11, 2016. ^ Nox (July 22, 2014). "7 Days to Die Server Setup". Game Server Setup. ^ Matulef, Jeffrey (August 16, 2013). "7 Days to Die combines a voxel-based sandbox with zombies". Eurogamer. ^ Schulenberg, Thomas (July 27, 2013). "7 Days to Die smells blood, rushes to Kickstarter". Engadget (Joystiq). Retrieved June 11, 2018. ^ Kubba, Sinan (August 9, 2013). "Steam gives Satellite Reign, 7 Days to Die and others the Greenlight". Engadget (Joystiq). Oath Inc. Retrieved June 11, 2018. ^ rhuenink (August 2, 2013). "We're number one on Steam Greenlight!". 7 Days to Die. ^ rhuenink (September 8, 2013). "Alpha1.1a Security Update is out!". 7 Days to Die. ^ "Alpha 8 Patch Notes". Envul. Retrieved May 7, 2014. ^ rhuenink (November 22, 2014). "Alpha 10 Apocalypse Release Is Out!". 7 Days to Die. ^ rhuenink (April 2, 2015). "Alpha 11 Annihilation Release Is Out!". 7 Days to Die. ^ rhuenink (July 3, 2015). "Mini Bikes & Physics & Bears A12!". 7 Days to Die. ^ rhuenink (December 10, 2015). "Alpha 13 Status And Release Notes!". 7 Days to Die. ^ Jeffreys, Steve (December 5, 2015). "7 Days to Die Waiting for Alpha 13: The Struggle is Real". PowerLeveled. Nerd Interests LLC. ^ rhuenink (March 26, 2016). "Alpha 14 Hits The Streets!". 7 Days to Die. ^ rhuenink (October 5, 2016). "Alpha 15 Release Notes". 7 Days to Die. ^ rhuenink (June 6, 2017). "Alpha 16 Is Out". 7 Days to Die. ^ "The Official A17 Developer's Diary for Developers". 7daystodie.com. Retrieved 25 December 2018. ^ Matulef, Jeffrey (April 7, 2016). "Telltale to publish open-world survival game 7 Days to Die on consoles". Eurogamer. Gamer Network. Retrieved April 7, 2016. ^ Devore, Jordan (July 11, 2016). "Review: 7 Days to Die (XOne)". Destructoid. Enthusiast Gaming. Retrieved July 11, 2016. ^ "7 Days to Die (PS4)". GamesMaster. Future plc. September 2016. p. 74. ^ Gilroy, Joab (July 7, 2016). "7 Days to Die Review (XOne)". GameSpot. CBS Interactive. Retrieved July 7, 2016. ^ Johnson, Leif (July 13, 2016). "7 Days to Die Review (Xbox One)". IGN. Ziff Davis. Retrieved July 13, 2016. ^ "7 Days to Die". PlayStation Official Magazine – UK. Future plc. September 2016. p. 103. ^ Taylor, Peter (July 19, 2016). "7 Days to Die Review (XOne)". The Digital Fix. Poisonous Monkey. Archived from the original on July 22, 2016. Retrieved June 11, 2018. ^ "7 Days To Die review - undead on arrival (XOne)". Metro. DMG Media. July 5, 2016. Retrieved June 11, 2018. 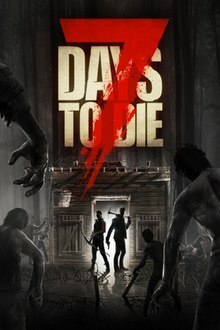 ^ a b "7 Days to Die for PlayStation 4 Reviews". Metacritic. CBS Interactive. Retrieved June 28, 2016. ^ a b "7 Days to Die for Xbox One Reviews". Metacritic. CBS Interactive. Retrieved June 28, 2016. ^ "7 Days to Die". Steam. Valve Corporation. ^ Meer, Alec (January 2, 2018). "These are the top 100 Steam games of 2017". Rock, Paper, Shotgun. Retrieved June 29, 2018.